Apparatus for simulating flames, the apparatus comprising a source of light, simulated flame effect means for reflecting said light to simulate flames, simulated fuel means to simulate a bed of combusting fuel, and screen means on which to view an image of the simulated flames, said screen means being positioned between said flame effect means and said simulated fuel means, said screen means being capable of diffusely transmitting light reflected by said flame effect means and also being capable of reflecting light from said simulated fuel means so that the simulated flames appear to emanate between the simulated fuel means and an image of the latter means reflected in said screen means. 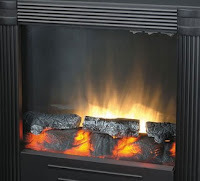 In other words, there are fake logs in front of a translucent screen, and a fake flame effect is projected onto the screen from behind, by a light source via reflection. Since the screen is itself somewhat reflective, an image of the fake logs is visible behind the screen, so that the fake flames appear to rise from between the outer fake logs, and the inner fake-log-image. Heaters imported by the respondents differ from the preferred embodiments of the invention described in Bitech's patent specification in the way that light passes from the source to the screen. Bitech's heaters use a "specular reflector" (ie a smooth "mirror-like" surface), whereas in the allegedly infringing heaters light passes from the source to the screen by a combination of direct transmission and diffuse reflection. These facts were not in dispute. In the original proceedings Garth argued that its heaters did not infringe because they relied primarily upon direct transmission of light, rather than reflection as in the Bitech claims, and also that its reflections were diffuse, rather than specular as in the Bitech heaters. The Judge at first instance found that there was no requirement in the claim for specular reflection, but that the Garth heaters nonetheless avoided infringement due to their substantial reliance upon direct transmission of light. The Full Court agreed with the primary Judge that there is no limitation in the Bitech claims to specular reflection. However, it disagreed with his analysis of the infringement issue relating to the role of directly-transmitted light. The primary Judge introduced a qualification that does not appear in the claims, namely that the flame effect means does not ‘substantially rely upon’ or ‘involve to any significant degree’ a process involving light directly emitted from, rather than reflected from, the light source. The claims do not exclude the presence of light additional to the reflected light, so long as the apparatus possesses the means for reflecting light to simulate flames. Bitech accepts that a de minimis contribution by reflected light would not be sufficient to satisfy the claimed integer, but that was not the primary Judge’s finding. The primary Judge observed ... that about half the viewing screen was occupied across its full width by the images sourced from reflected light, even though the images created by directly emitted light were found in the centre area of the viewing screen, were brighter and fuller than the other images and dominated the flame effect. In other words, a claim to the use of reflected light, absent some express indication to the contrary, encompasses the use of reflected light in combination with other sources of light, so long as the contribution of the reflected component is not negligible. This is, of course, consistent with established principles of claim construction. Garth's submissions on fair basis essentially complemented Bitech's infringement argument. In particular, Garth argued that because the patent specification did not describe any embodiments of the invention that did not rely solely on reflected light, then a claim encompassing a wider range of embodiments including other forms of light transmission could not be fairly based on the description. Fundamental to Garth Living’s submissions on fair basis is an analysis centred on the proposition that neither the specification nor claim 1 refers to a source of direct light. The submission seems to be that if there is infringement by a flame effect means that utilises reflected light and also direct light, the specification must disclose or describe that additional integer. That is simply not the requirement for fair basis. Claims can extend beyond the scope of preferred embodiments. The skilled addressee would not read the specification as imposing serial restrictions or limitations on the invention. The specification describes different preferred ways in which integers of the invention can be made to maximise the solution to the different problems of the prior art. Those are reflected in the dependent claims. In summary, the Full Court found that Bitech's patent is valid, and infringed by the respondents. The decision confirms established law regarding the interpretation of patent claims for infringement purposes, and of the analysis for fair basis.